In a long-awaited addition to local radio, the New Year will bring Democracy Now! to Chicago's progressive talk station. Hosted by Amy Goodman and Juan González, the New York-based show is billed as "a daily independent global news hour," funded entirely by audience and foundation grants. 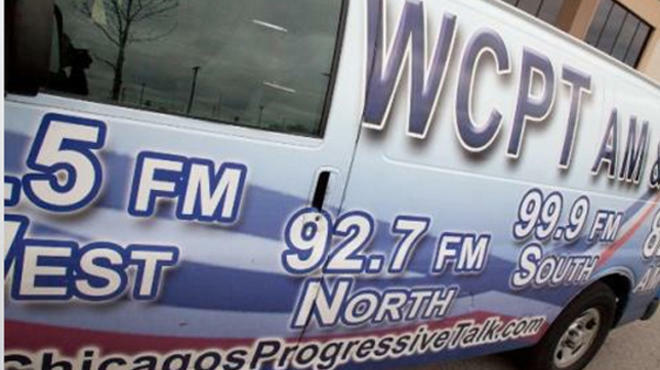 Starting Wednesday, it will air at 8pm weeknights on Newsweb Radio's WCPT-AM (820) — simulcast on WCPY-FM (92.5), WCPT-FM (92.7), WCPQ-FM (99.9) and ChicagosProgressiveTalk.com. It will replace Leslie Marshall's syndicated talk show on WCPT's lineup. Launched by Pacifica Radio in 1996, Democracy Now! became an independent non-profit entity in 2002. Up to now, it's been airing here only on Chicago Community Access Network Channel 19 and Chicagoland Radio Information Service for the blind and print-handicapped. For years, citizens groups such as Chicago Media Action and Illinois Coalition for Justice, Peace and the Environment have been petitioning Chicago Public Media to air Democracy Now! on WBEZ-FM (91.5). WCPT also recently picked up Smiley & West, which previously aired on WBEZ, and The Tavis Smiley Show. With Tribune Co. finally emerging from bankruptcy after four years, the Chicago-based media giant was forced to endure one more embarrassment, courtesy of billionaire vulgarian Sam Zell. The Sun-Times reported last week that the woman Zell handpicked to handle real estate transactions for Tribune Co. has been indicted by a federal grand jury for bilking the company out of $260,000. So not only was Zell unfit to own a big media company, it turns out he wasn’t very good at his supposed area of expertise — managing real estate holdings — either. It's another December to remember for WLIT-FM (93.9), the Clear Channel adult-contemporary station. In Arbitron figures released last week for the period from November 8 to December 5, The Holiday Lite more than tripled its audience, jumping from 14th place to second overall with a 6.0 percent share. (The station began airing all-Christmas music November 9.) Even so, competitors noted it was Lite FM's worst November/December ratings performance in the past four years. Jake Hartford was as surprised as his listeners Saturday when WLS-AM (890) began running promos for a gold infomercial program to air during his own Awake With Jake time period, starting next weekend. Bosses of the Cumulus Media news/talk station did not respond to inquiries Sunday. "When I heard the promo, I figured that when management decided when it was time for me to know, then I would know," Hartford said. He's been a Saturday morning fixture for 15 years (including a two-year detour on WCPT). The good news is that Hartford is being heard more than ever on WLS these days. Since September, he's also been co-hosting from 9 to 11am Monday through Friday with Tribune columnist John Kass.